An ohm is an ohm, right? Not so fast — there are many different types of resistors. To insure that your circuit works and stays working, use the right type of resistor. In this article, you'll learn about the common types of resistors and their special characteristics. A perfect resistor does not care whether the current flowing through it is AC or DC. The electrons collide with atoms going in either direction. FIGURE 1. Resistors can be constructed in a number of ways to optimize power handling, stability, or size. 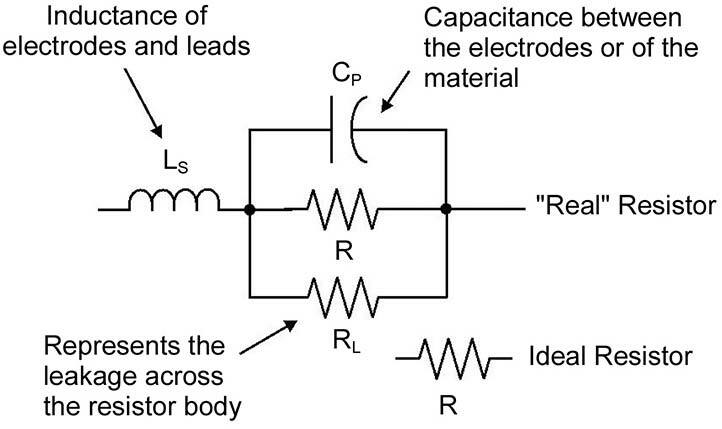 Nevertheless, practical construction details, as shown in Figure 1, create some parasitic effects, making an actual resistor act like the circuit model shown in Figure 2. The model describes how the actual resistor’s characteristics make its electrical behavior depend on frequency and on how voltage and current are applied to it. FIGURE 2. This is a model of how a resistor actually behaves in a circuit. The type of resistor determines the importance of each component. The series inductance, LS, is primarily created by the leads attached to the resistor. 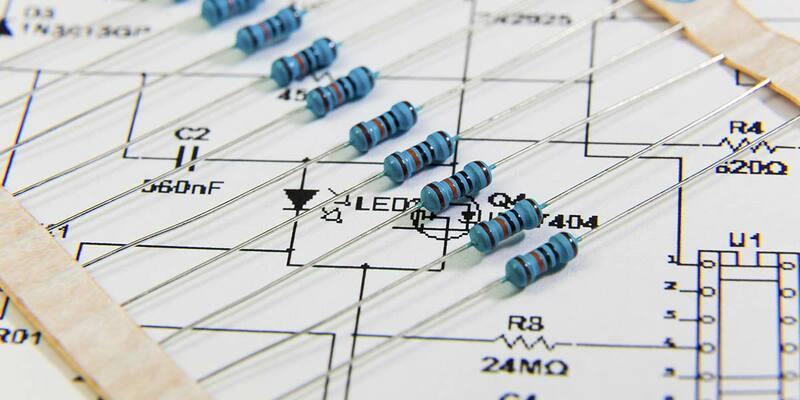 Notice that for the surface-mount resistor, there are no leads, which greatly reduces LS. The electrodes also form a very small capacitor, CP, that affects the resistor’s behavior at very high frequencies. Although the resistor’s coating is a very good insulator, current can still flow in very small amounts across the surface of the resistor as a leakage current, represented by RP. This becomes important when the resistor has a very high value or is used in a high voltage circuit. For a piece of conducting material to be made into a practical resistor, a pair of electrodes and leads are attached so that current can flow. The resistor is coated with an insulating material to protect the conducting material from the surrounding environment and vice versa. There are several different resistor construction methods and body styles or packages that are designed for a certain range of applied voltage, power dissipation, or other considerations. Composition means that the resistive material is a mix of carbon and stabilizing compounds. The amount of carbon in the mix determines the resistance of the material. A small cylinder, like a pencil lead, is held between the two electrodes and coated with resin or phenolic, making a non-inductive resistor with low LS that is often used in RF circuits. Carbon comp resistors are available with power ratings of 1/4 to 2 watts. They can also handle temporary overloads much better than film resistors because the heat is distributed evenly throughout the cylinder of resistive material. That makes them a good choice for circuits that protect against and absorb pulses and transients, for example. Unfortunately, these resistors are also strongly influenced by temperature and humidity and so are not good for circuits that depend on precise, stable resistance values. In a film resistor, the resistive material is a very thin coating of carbon or metal on an insulating substrate, such as ceramic or glass. 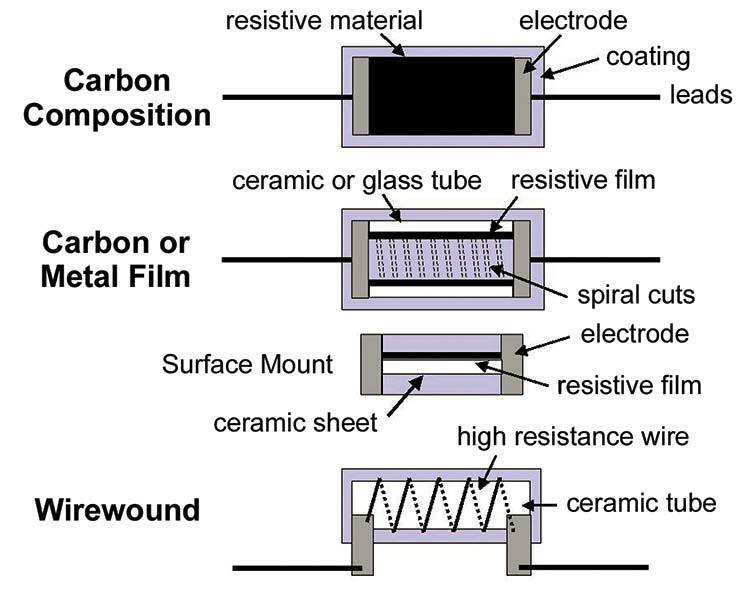 The value of the resistance is determined by the thickness of the film and the amount of carbon or metal in it. These resistors are available with very accurate and stable values. A drawback of film resistors is that they are unable to handle large amounts of power because the film is so thin. Overloads can also damage the film by creating “hot spots” inside the resistor, changing its value permanently. The value of film resistors is sometimes adjusted before sealing by cutting away some of the film with a laser, a process called trimming. If the film is deposited on the inside of a tube, the trimming process creates a coil-like current path that raises the LS of the resistor. If your circuit operates at high frequencies, be sure the resistors you select have a low value of LS. Surface-mount resistors are almost always film resistors. These resistors have no leads at all, so LS is very low. The film is deposited on a ceramic sheet. Because of their extremely small size, surface-mount resistors have very low power ratings — from 1/10 to 1/4 watt. Common in power supplies and other equipment where lots of power is dissipated, a wirewound resistor is made just as you might expect. A high-resistance wire is wound on an insulating form — usually a ceramic tube — and attached to electrodes at each end. These are made to dissipate a lot of power in sizes from one-watt to hundreds of watts! Wirewound resistors are usually intended to be air cooled, but some styles have a metal case that can be attached to a heatsink or metal chassis to get rid of undesired heat. Because the resistive material in these resistors is wound on a form, they have very high LS. For this reason, wirewound resistors are not used in audio and RF circuits. Be careful when using a resistor from your junk box or a grab bag in such a circuit! Small wirewound resistors look an awful lot like film or carbon comp resistors. There is usually a wide color band on wirewound resistors, but not always. If you’re in doubt, test the resistor at the frequencies you expect to encounter. There are special versions with windings that cancel most of the inductance, but have a much higher CP that also affects the resistor’s performance above 50 kHz. If you need a high-power non-inductive resistor, you can use cermet (ceramic-metal mix) or metal oxide resistors. These are constructed much like a carbon comp resistor, substituting the cermet or metal oxide for the carbon composition material. There are many different types of adjustable resistors. The simplest are wirewound resistors with some of the wire exposed so that a movable electrode can be attached. The most common are adjusted with a rotary shaft as shown in Figure 3. The element provides a fixed resistance between terminals 1 and 3. The wiper moves to contact the element at different positions, changing the resistance between either end of the element and terminal 2. FIGURE 3. 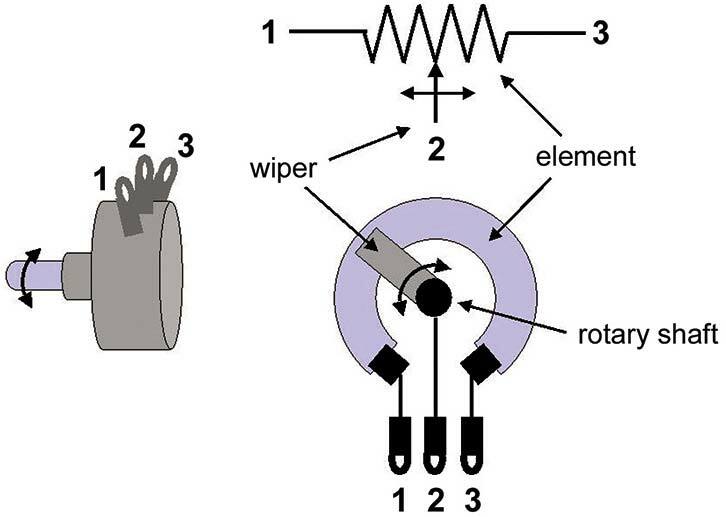 A potentiometer (or pot) acts as a variable voltage divider by moving a wiper across the surface of a fixed-resistance element. If an adjustable resistor has only two terminals (1 and 2 in the figure), then it is called a rheostat and acts as an adjustable resistance. Most rheostats are intended for use in high-power circuits with power ratings from several watts to several tens of watts. If the adjustable resistor has three terminals, it is called a potentiometer or “pot” for short. Most pots are intended to act as voltage dividers and can be made into a rheostat by leaving terminal 1 or 3 unconnected. Miniature versions called trimmers mount on a circuit board and are used to make small adjustments or calibrate a circuit. They are available in single-turn or multi-turn versions. Larger pots with 1/8” or 1/4” diameter shafts are intended for use as a user control. Pots are available with resistance values from a few ohms to several megohms and with power ratings up to five watts. Like fixed-value resistors, the construction of the pot is important. Higher-power pots may have a wirewound element that has enough inductance to be unsuitable for audio or RF signals. Smaller pots, particularly trimpots, are not designed to be strong enough for use as a frequently-adjusted control. Most pots have relatively high values of CP, as well. Pots are also available with elements that have a non-linear taper or change of resistance with wiper position. For example, a log taper pot has a resistance that changes logarithmically with shaft rotation. This is useful in attenuator circuits, for example. An audio taper pot is used to create a voltage divider that mimics the loudness response of the human ear so that volume appears to change linearly with control rotation. In order to save space on printed circuit boards, resistor networks are often used. These are miniature printed circuits themselves, placing several resistors on one substrate. The resistors may be isolated from each other, share one common terminal, or be connected in series. There are a number of configurations that can be found in any component supplier’s catalog. After value, power dissipation is the next most important characteristic of a resistor. An overloaded resistor often changes in value over time and can often get hot enough to burn itself and surrounding components. Every circuit designer learns the smell of burnt resistor sooner or later! The common rule of thumb is to calculate how much power the resistor will have to dissipate and then use the next largest size or a factor of two higher dissipation rating, whichever is larger. The power rating is based on unobstructed air circulation around the resistor. For resistors dissipating more than a watt, arrange nearby components so that air can circulate freely. If possible, mount power resistors horizontally so that convection cools all parts of the resistor equally. Learning the resistor color code (“Bad boys ravish ...”) is a rite of passage for electronics techs the world over. 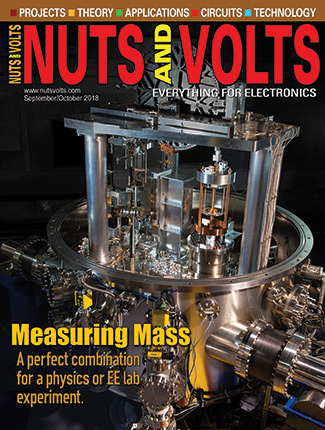 A handy Web guide is available at https://physics.ucsd.edu/neurophysics/courses/physics_120/resistorcharts.pdf or just type in “resistor color code” to an Internet search engine. Surface mount and power resistors may also have the value printed on their body as a three- or four-digit code with the final digit acting as an exponent. For example, ‘513’ means 51 x 103 or 51KΩ. Resistors have a nominal value and a tolerance (the amount of acceptable variation above or below the nominal value). Most resistors have a 1%, 5%, or 10% tolerance and you can find smaller or tighter tolerances. Which values of resistors are available is determined by the tolerance series. For example, in the 5% series, values are selected so that each is approximately twice the tolerance or 10% from the next highest or lowest value. Resistors also change value with temperature. The relative change of resistance with temperature is called the temperature coefficient or tempco and it is specified as parts per million or ppm or as percentage change per degree Celcius of temperature change. A positive tempco means that resistor value increases with temperature. When designing and constructing sensitive circuits that use precision (1% or tighter tolerance) resistors, it is important to keep them at an even temperature. Here are some special applications that require special types of resistors. These aren’t hard and fast rules, but can guide your initial selection. For most circuits, plain old carbon film or carbon comp resistors will work just fine. Remember to consider what is important for your circuit — value, power or voltage, stability, cost — then look for the resistor type that meets those requirements. To learn more about resistors, definitions are available from the Resistor Term Glossary at http://prpinc.com/customer-aids/glossary-of-industry-terms Download the article on choosing resistors “Ask the Applications Engineer #24” from Analog Devices’ website at www.analog.com/library/analogDialogue/archives/31-1/Ask_Engineer.html. Serious designers will want to find a copy of The Resistor Handbook by Kaiser (CJ Publishing, 2851 W. 127th St., Olathe, KS 66061) which is a good reference. 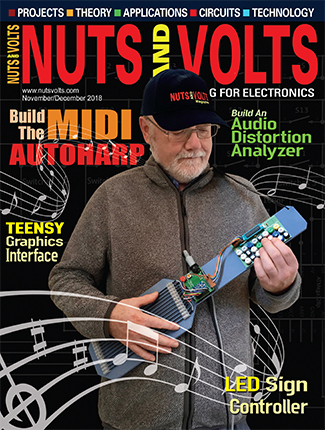 H. Ward Silver is an engineer, writer, and teacher with over 30 years of practical experience in medical electronics, instrumentation design, and broadcasting. 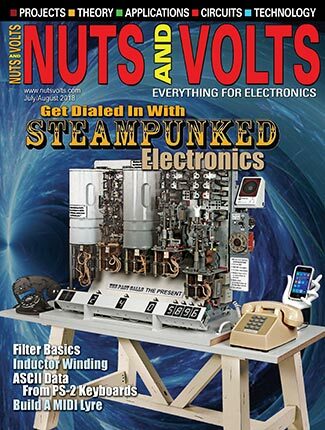 He is the author of Two-Way Radios and Scanners for Dummies and Ham Radio for Dummies by Wiley Press and numerous articles for QST magazine. 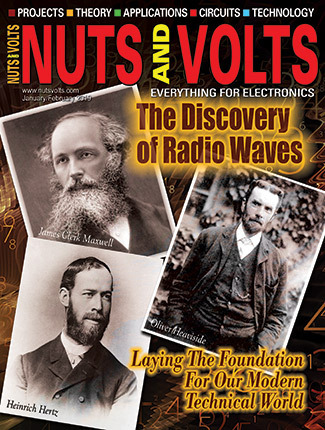 Ward’s ham radio call sign is NØAX.